Cumulative rhyming text with progressively complex build-up leading to a possibly anti-climactic twist at the end certainly has its appeal. At least for me. The lilting text and whimsical illustrations seem to have appealed to both the five- and two-year old in residence, making this book a recent favorite in our household. Celtic New Year fell on November 1st, known as Samhain (Summer's End), possibly coinciding with the harvest. The day before was believed to be the time to scare away the ghosts and demons (symbolically our own fears and negativity perhaps?) by lighting bonfires, which, history tells us, is possibly one of the origins of Halloween (All Hallows Evening) as celebrated today. Halloween, with its roots reaching across many cultures, is probably not embraced universally - elements of anxiety and foreboding seem to be practically mandatory around this festival. Especially since the various supernatural and unearthly creatures are supposed to swarm the human world on this particular eve, seizing their one chance to live up to their names. While we focus on harvest and read many wonderful books on the subject at home, it is nice to indulge once in a while and pick out a "Halloween" book, whether we choose to celebrate it or not. Especially when it has something interesting to offer, not just run-of-the-mill. The illustrations in By The Light Of The Halloween Moon are delightful: All we see at the top of the page is a decrepit wooden bridge over marshy water that reflects a full moon, with a pair of legs dangling. A lean and gleaming toe. by the light, by the light, by the silvery light of the Halloween moon! Thus starts this tale, with the slip of a girl sitting by the river wriggling her innocuous toe. One by one, a (thin black wisp of a spying) cat, a (watchful) witch, a (bungling bouncy breezy) bat reach for this tapping toe. Each one thwarting the previous one's attempt in order to get the said toe, and its owner, for themselves. Kevin Hawkes (whom we first encountered in Library Lion) adds clever touches that are witty and whimsical, invoking a mixture of absurd and scary at the same time, on each double-page spread that has a pitch black night as the background. As each creature reaches out for the toe, the tension builds up as the young readers hold their breath wondering who will eventually grab the toe and assimilate its owner. However, the mounting suspense is beautifully counterbalanced by the little touches in the illustrations that even the two-year-old found amusing. For example, the expression on the little black cat's face when the witch snatches him and tucks him under one arm, while the saucer-eyed bat bungles on with a wild and startled expression, instigates un-muffled giggles in both the two-and-five-year old every time we read it. Also, having a resident black cat, one of our much-hugged and totally-adored pet, probably helped nix any superstitions/fears regarding these sweet yet misrepresented creatures. All that anticipation is not wasted when we see a self-assured girl stating in no uncertain terms, "Oh no, you don't!" as she smacks the sprite when it almost had her toe. Now you get the picture, don't you?! The book is not so much about showcasing the scary creatures in their hair-raising form or dismissing them with goofy enough representations to inspire unadulterated laughter. It presents what could be a very real close-encounter-of-sorts if we let our fears manage us, while subtly planting the message that all the little girl has to do is stand up for herself and refuse to be intimidated or victimized by things that assume they have some sort of power over her. At least, that is one possible interpretation this mom likes to contrive. Although the supernatural world is crossed with reality when the girl encounters these strange beings while relaxing by the river, the book also presents a powerful tool at every child's disposal: "No! Go Away!" is all the little girl had to say to banish them from her realm and gain control over what she feels and experiences - tangible or otherwise. The book is certainly not in the cute end of the spectrum, nor is it in the spine-chilling end. It has elements that could potentially unsettle an impressionable child, even if temporarily: why do they want her? what would they do with/to her? - are relevant questions in this context, but rather moot. The overall tone is quite cheerful and affirming - especially the last page where these creatures just disperse quietly knowing they've been categorically rejected. 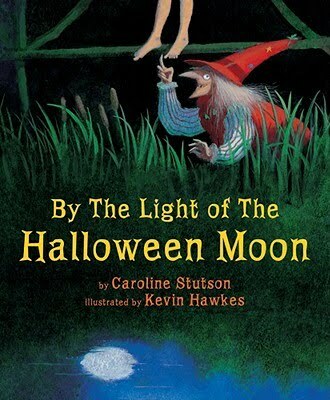 The feet-tapping rhythm and lively unfolding of events, coupled with delightful illustrations, makes this book a real treat, possibly even an emerging a Halloween classic for us, much like The Night Before Christmas has become the Christmas Eve tradition.